Hello everyone! We’re excited to release a new extension today: WooCommerce Checkout Add-ons. What does WooCommerce Checkout Add-ons do? Great question. Have you ever wanted to add services or products (both free and paid) to your checkout? 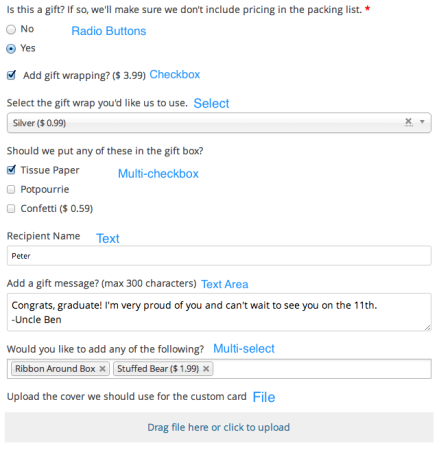 For example, do you want to provide gift wrapping services or the option to add gift messages to your store’s orders? Yep, that’s what Checkout Add-ons is for! Each of this fields can optionally add a cost to the order total, and these costs can be taxable or nontaxable. The fields that have multiple options can add a costs for each option if desired. Simple! 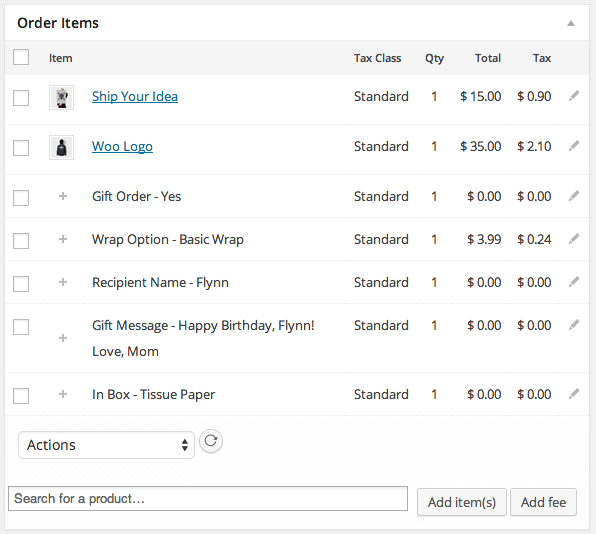 WooCommerce Checkout Add-ons gives you a fast, easy way to add additional products (such as samples) or services (such as rush fulfillment or gift wrapping) to your checkout process! 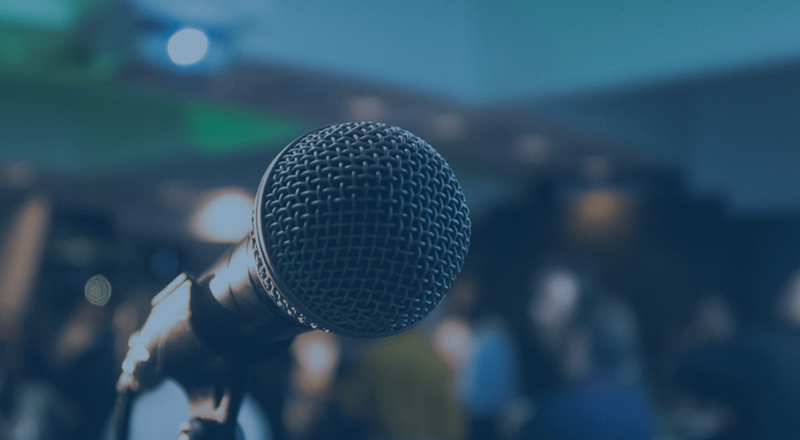 You can get more details on the WooCommerce product page or view the full plugin documentation. Love the plugin idea. Problem we have is we need checkout fields that only show up if a certain product is purchased. Say Eye Maekup then in the checkout it also asks them for the colours they selected at this point? Is that possible at all? Hey Stephen, it sounds like Product Add-ons is a better fit, as this can be done right from the product page instead. You could add a dropdown for colors on the product page that will be added to the cart with the product. Checkout Add-ons is meant for something that applies to the whole order, like rush handling or other overall services. Hi, this looks great 🙂 But will the add-ons also be displayed in the e-mails notifications – like the Admins ‘New order’ e-mail? Hey Nick, checkout add-ons are automatically added to emails 🙂 . Cheers! How do we hide the add-ons in admin emails? Hey Cecily, could you please submit a help request so our dev team can help out? Thanks! First of all, many thanks for this plugin. I am using it on a client’s website and unfortunately, am running into the following issues. – I have added the add ons to the shopping cart page and unfortunately, the add ons seem to disappear from the cart contents when the cart is updated with new item numbers or when coming back from the checkout page. (the checkboxes on the other hand are still checked and textarea still filled). Could you please take a look? Many thanks. Please let me know if there’s a better way for me to communicate these things. Hey Marie, thanks for getting in touch! I’ll ping the dev team to check this out to see if we can replicate it. In the meantime, could you please submit a support ticket here in case it’s something in your environment, and then reply back with the 6-digit ticket number? That way I can pull the ticket and make sure it’s assigned. Thanks so much! We are seeing this same issue. Has there been a resolution? Hey great plug in I have an issue though. I need checkout fields that only show up if a product in a certain category is in the cart. Also have Product Add-ons too but I am selling a subscription based service using a pricing table to add the products in this category to the cart. But Product Add-ons doesn’t help because I am by passing the product page completely by using the pricing table on a page. Is there a function that I can add to my themes function file that will notice if a product from a certain category is in the cart and if so display those add-ons for the product in that category? Suggestion for updates: Add a selection like Product Add-ons has to choose what category to display that add-on too on the check out page. Hey Jose, while I think that Product Add-ons handles product-specific fields very well for the majority of users, a field based on product category could be a good fit for the plugin. I’ve added it to our roadmap to investigate 🙂 . In the meantime, you could achieve this with custom code, which would be more than we could cover here. We typically recommend Codeable for these sorts of jobs, and our link is good for 5% off your first job. i want plugin which can additional field field delivery date and time and add additional cost on cart not on each product when choose midnight(12:00 Am)delivery time. Is this plugin is can solve my issue ? Hey Arpit, I’m afraid this plugin won’t be a good fit, as it doesn’t have date fields for add-ons at checkout. Would you consider adding date fields? This would be a great way to alter the date on WooCommerce Booking items, rather than having to delete items and add them again. Great plugin. 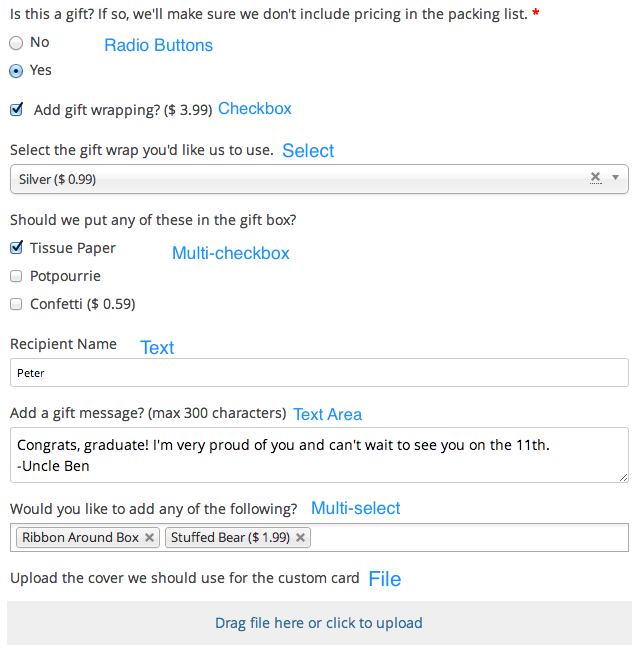 Only issue I have is that the selected options (wrap as a gift yes or no, and the personal message itself) isn’t displayed at checkout before order confirmation. Hey Johan, we’d be happy to. Could you please open a help request and let me know of the ticket number? Thanks! How to set this checkout addons for cart page instead of checkout page.